Moon Phase schedules show the exact time the phase will occur and even when the full moon is considered a “Blue Moon”. 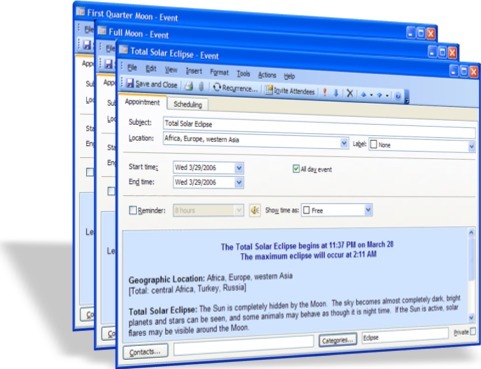 Eclipse schedules include the time the eclipse will begin, when it will reach its’ maximum, and the geographical location where it will be visible. We also include a brief description of the type of eclipse occurring. The schedules are formatted for specific time zones. By supporting individual time zones, our information is more accurate than what is shown on a typical wall calendar. For example, a Full Moon occurring at 1:30 AM EST in New York would occur one day earlier at 10:30 PM PST in Los Angeles. Our schedules reflect this variance. Select a lunar event category below or click here to browse all lunar events.